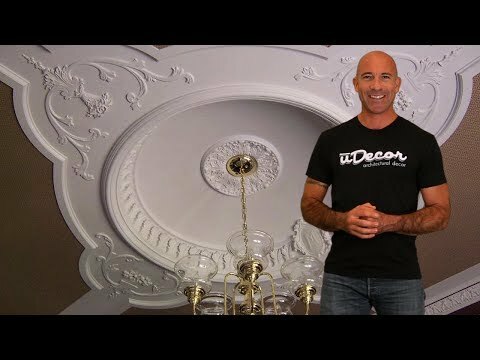 The MD-9114 Ceiling Medallion is 30" in diameter and has a depth of 1-5/8". Ceiling medallions are also finding their way onto walls in the modern home. Our sturdy, yet lightweight medallions make it easy to mount them to vertical surfaces! Some of our medallions come with pre-cut holes while others do not. If you need a hole in your medallion you can have us drill it for you. Just select the option at the time of check out. If you prefer, you can drill the hole yourself. Polyurethane is easy to drill and work with. We recommend using a generous amount of construction adhesive during installation and holding the medallion in place, momentarily, while the adhesive takes effect. You can use low tack painters tape to hold the medallion in place. If you are installing the medallion with a ceiling fan, chandelier or light, make sure the power is shut off at the breaker before attempting installation. Turning off the light switch WILL NOT prevent you from being shocked. If you have any doubts call an electrician. You may need longer bolts or a longer threaded tube that came with your fixture to accommodate the thickness of the medallion. You can get these at any home improvement store. Great products. Very efficient delivery and order fulfilling. Would highly recommend. Very happy, enhanced the area greatly.